"Clarice Scheeringa of Ripon, California shares this dressed-up asparagus. 'I live in the heart of asparagus country, so I'm always on the look out for new ways to serve it,' she explains. 'Lemon and a touch of tarragon make it a quick elegant side dish.'" 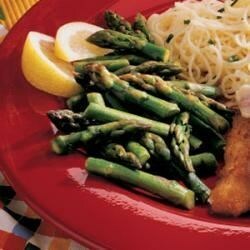 Place asparagus and water in a 1-1/2-qt. microwave-safe bowl. Cover and microwave on high for 7-8 minutes or until crisp-tender; drain. Add butter, lemon juice and tarragon; toss to coat. Sprinkle with salt and pepper. Good basic start. I didn't add the tarragon cause there was none handy at my house, and I steamed the asparagus instead but still delis! i used half the butter and didn't melt it ahead of time ... used it to butter the asparagus after it was drained. this was the first time i cooked asparagus and it was a winner! Very good! I served mine with baked potatoes and pork chops. I think I added more taragon and lemon juice, just to make the tangy taste more pronounced. Wonderful still! came out of the microwave kinda limp, but tasted wonderful! THIS is how I'm making asparagus from now on. Perfect lower-fat alternative to hollandaise! Yummy!